People may have been forced to forego the more luxurious things in life during the global economic slowdown, but style is one thing that will never go out of fashion in China. Business has continued to boom for bespoke tailors in Beijing. 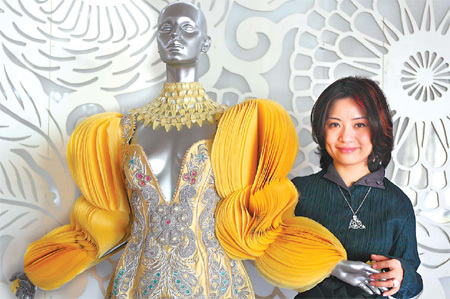 "I didn't feel the pinch during last year's economic turmoil," said Guo Pei, president of Rose Studio, one of the capital's first bespoke tailor shops based in Chaoyang district. Guo said business increased by 30 percent year on year in 2008. As the economy has developed swiftly, the nation's nouveau riche has acquired a taste for luxury goods. One of the results is the soaring popularity of haute couture fashion, which originated in France in the 19th century. Rose Studio has more than 1,000 regular customers, mostly movie stars, businesspeople and politicians in Beijing. Guo said many clients buy 30 to 40 dresses every year and some have been buying from her for more than 10 years. Membership fee is 50,000 yuan ($7300), from which the cost of garments will be reduced. "I think some are just addicted to the idea of collecting tailor-made clothes," she said. For Wang Ying, she definitely got the most of her tailor-made dresses. She recently spent more than 12,000 yuan - almost a third of her monthly salary - on three specially-made garments for her big day: a white wedding gown, a purple dress and a traditional red cheongsam. "It was expensive but it was totally worth it," said Wang, 33, chief representative in Beijing for a Danish IT company. The popularity of bespoke tailoring in China is down to the general elevation in people's living standards, according to Yang Jian, secretary general for the organizing committee of China Fashion Week. Before 1996, most had no concept of bespoke tailoring, Yang said. People went to tailors simply because they charged less than shops that sold ready-made clothes. But as people have grown less concerned with the fundamentals of food, shelter and simple clothing, they have begun to pursue luxury extras like exquisite garments, which has boosted the bespoke market. "It took almost 10 years to develop the market," Yang said. "Beijing has gone from none to more than 200 bespoke tailor shops now. And it's still expanding swiftly." According to fashion experts, there are two major differences between the Chinese and foreign haute couture markets. In Europe and the US, 95 percent of customers are female, while in China, male and female make an equal number of purchases. The reason is that Chinese men are generally richer and more powerful, and expensive clothes are a symbol of their social status. The other difference is that, in developed countries, bespoke tailoring caters only to the super rich. In China, the market is gradually shifting from the super rich to average citizens with decent incomes. A manager surnamed Fan at Queenree, a tailor shop in Chaoyang district, said that customers mainly fall into three categories: white collars, businesspeople and expats. Office ladies whose annual income exceeds 200,000 yuan were one of the store's biggest clients, said Fan. "Their jobs require them to frequently attend social events," he said. "And they believe specially-made gowns will show off their personality and charm at these events." China is in the midst of a golden age of weddings, a boon for businesses from photo studios to global platinum miners and to the housing market. Shao Mingqing was a jobless young man with only a junior high school diploma when his luck turned around a few months ago with the skyrocketing price of garlic. George Clooney star of the film "Up In The Air" poses with girlfriend Elisabetta Canalis,at the film's premiere in Los Angeles, California November 30,2009. Jennifer Aniston attends the Gala evening to celebrate the re-opening of Hotel La Mamounia on November 26, 2009 in Marrakech, Morocco. Female applicants for the army are being asked to showcase their talents in an interview process never before used and exclusively for women.